I woke up early, while the sky was still dark. While sipping coffee, I watched the raising sun mold the shapes around Phou Ka-tae. I went out on my bicycle before the sun got up to full speed and went to survey the changes that the seasons were making near Salavan. I left the main road at Na Khoy Sao Village. Although everyone laughs when they say the name, which means 'the rice field waiting for girls,' no one can tell me the history of the name. Did the men come first and they had to wait for their wives? Did they send for women once the fields were opened up? Was it an old military camp during the 'Vietnam' War? I could speculate on and on. While the dry season is easier for bicycling - didn't get stuck in mud at least - the dust can be just as bad. This fine material can be several inches thick and it's difficult for pedaling. And if a car or motorcycle goes by, it stirs up the dust so that I can't see for several minutes. 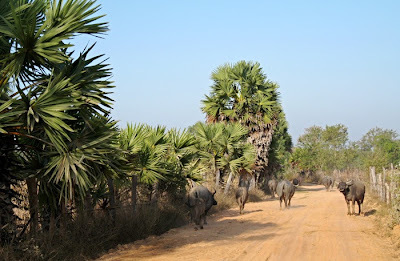 I took this picture of a herd of buffalo a farmer had just released so they could forage for the day. 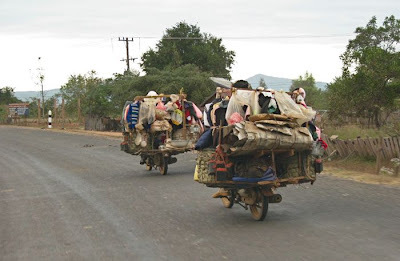 There are always interesting vehicles crowding the roads - two-wheeled tractors pulling trailers packed with families and neighbors going to town for the day, motorcycles pulling handcarts, with the passenger sitting on the cross-bar of the cart, or motorcycle vendors, like those below. They are mostly Vietnamese vendors who stock up and go to the most remote areas to sell their wares. Rural people rely on them for buying pots and pans, new clothes, or motorcycle batteries which they can use to power a small light bulb.